Yep. It happened. And you missed it. 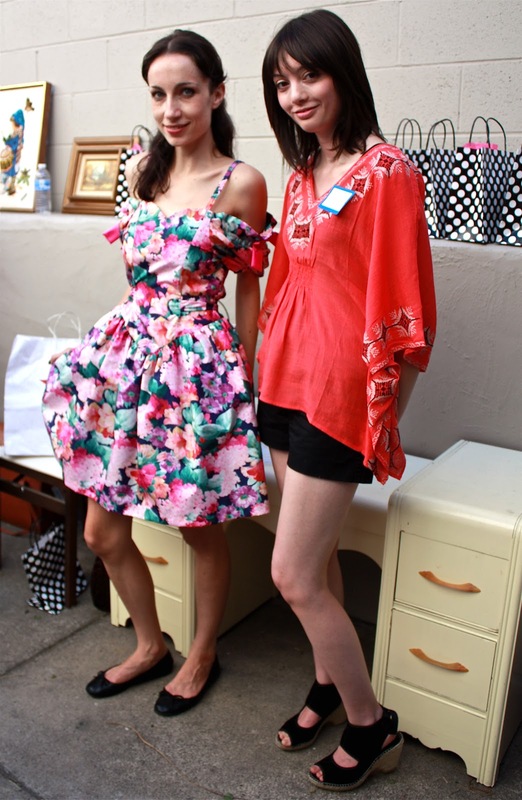 Last Saturday, in the early afternoon of September 25th,, a handful of Sacramento fashion bloggers met at Crimson & Clover for the FIRST EVER Sacramento fashion blogger get-together. Some brought friends/photographers. A few knew each other. Most met for the very first time. I must say it was quite the handsome crowd. Quite stylish and smile-ish. Nibbling on home-made cupcakes and cookies (Thanks Nicole!) and sipping on lemonade, we made our introductions and talked. Many of the blogs I already follow and it was great to attach a face & name to the blog. We hung out at the side patio of the Crimson & Clover boutique. Our lovely hostesses, Kara and Nicole had set up the space with tables covered in gorgeous vintage linens, and fresh flower bouquets. There was a lovely array of finger foods to snack on while we chatted. One of the bloggers brought a bottle of wine, which we quickly opened up and as we sipped, we opened up. Nothing brings out the social in a social like some good ol' libations. There were swag bags for the bloggers. My favorite gifts were the hand-made pins and rings from Kara & Nicole as well as a 20% off coupon. Most of the crowd used it right away. I bought yet another fabu rose ring made by Porkchop Rules. A couple of the bloggers bought and immediate wore their finds: Eve of evelesco came out looking smashing in a lemon meringue chiffon nighty, worn as a top, and the always breath-taking Lisa of the Starship Narcissus changed from her vintage blue goddess dress into a surprisingly understated over-the-top '80's floral chintz print. Expect to see a few more posts about the event, and I'll be sure to add names, links to blogs and a little info about each blogger who attended. But for now enjoy a quick glimpse of Sacramento Fashion Blogger glamour! I should have been there, my name being Sacramento, don´t you think???? I would have LOVED for you two to be there! One day, dear Sacramento, and Jemina, we shall meet! these photos are soo beautiful and cute. very lovely and fun!! @ Sacramento: LOL. I close my eyes..
@ Lovely Luci Ana: thank you, sweetie! SO overdue to meet everyone. I love to see things progressing in Sacto. This looked like such a fun event. I love the photos, you look adorable in that dress and fascinator. Jen (of Wade & Assoc) it was so good to see you there! You are fabulous! Kim, it was a great event! Let's see if we can get you out to the next one!